You are here: Home / Miscellaneous / In search of the Higgs bozon . . . In search of the Higgs bozon . . . 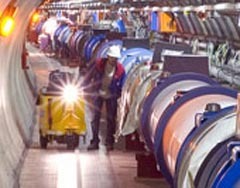 Dozens of University of Wisconsin scientists will play a role as the world&apos;s largest particle accelerator fires up today. You may have heard that the Large Hadron Collider located near Geneva, Switzerland could bring about the end of the world, as it smashes two beams of protons together at nearly the speed of light. "The concern apparently is creation of a mini black hole," explains UW Madison mathematician Terry Millar, who calls such concerns "not worth losing sleep over." And, there will be benefits to extending our understanding of the how the universe started, which he compares to the scientists who developed the Internet. Still, Millar&apos;s explanation of what are expected to be the primary initial discoveries from the collider are more than a little difficult for a non-scientist to get a fix on. "The two primary contributions that might pop out immediately are something that&apos;s called super symmetry, and the existence . . . of something called the Higgs bozon. This is the particle which gives fundamental particles their mass."